I hope you won’t mind me asking for your support? If you would like and are able to come, I’ll personally be very glad to arrange tickets for you – would you please just let me know for how many people, and for which evening/s? 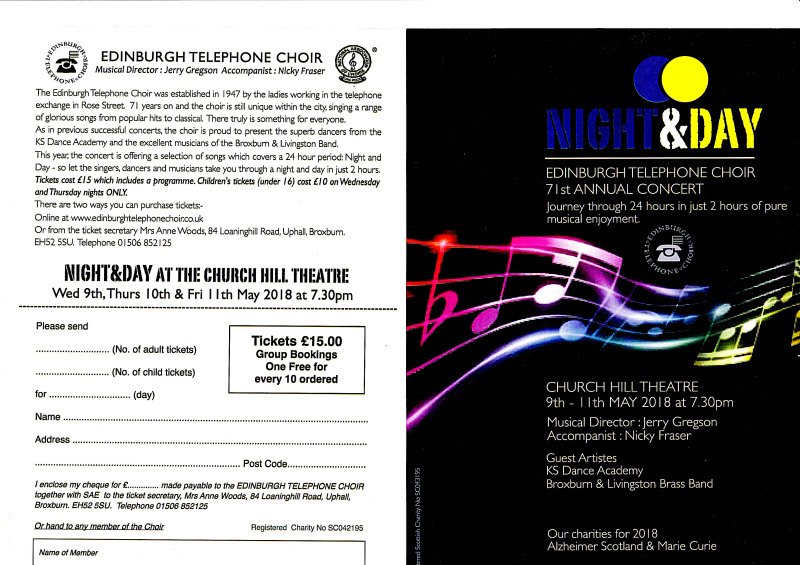 Alternatively, you can use the booking form on the attached ‘flier’ to make your tickets request, either by post to Mrs Anne Woods, 84 Loaninghill Road, Uphall, Broxburn, E52 5SU, or simply by phoning Anne on 01506 852 125. As a further alternative, you can now also buy tickets online at www.edinburghtelephonechoir.co.uk (A small booking fee applies this way.) Our choir is again being joined by the excellent KS Dance Academy and Broxburn and Livingston Brass Band, and I really think you’d enjoy what promises to be an extremely colourful and melodious evening. Hope you can help us achieve our 1,000-strong audience target! Thank You.